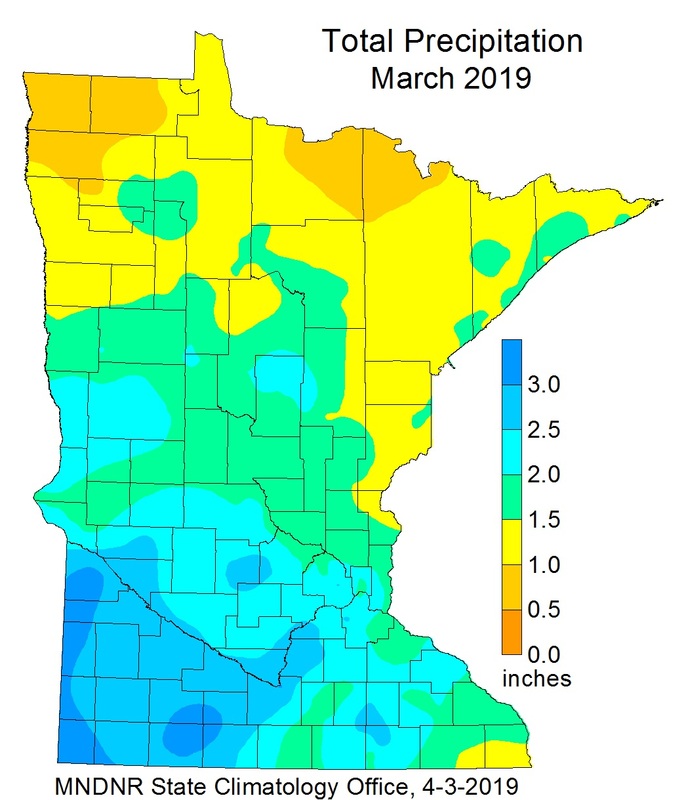 March monthly precipitation totals were generally above normal across the state with the wettest areas in west central and southwest Minnesota where departures of three quarters of an inch to an inch were common. Nearly all of the precipitation fell in the first ten days of the month with a snowstorm on March 1 and a significant rain and snow event on March 9-10. March came in like a lion, with a snowstorm on March 1. A small but potent weather system interacted with cold air over Minnesota to produce 3-6 inches of snow over the southern half of the state, with accumulations of 1-3 inches up to a Fargo-Duluth line in northern parts of the state. An area of very heavy snow surged northward through the western 1/4 of Minnesota on the morning of Saturday March 9th, 2019. Across southern Minnesota, warm air led to several hours of rain and occasional sleet, before changing over to heavy snow Saturday evening. Although the rain was generally light or briefly moderate by most standards, snow-blocked sewer grates left the rain nowhere to go, submerging intersections and low spots in cities and towns throughout southern Minnesota. This storm had a lot of warm air and very high moisture content, leading to rainfall of up to a half-inch in southern Minnesota, along with heavy, wet, sticky snow elsewhere. The vast majority of the state received between a half-inch and 1.25 inches of precipitation. The snow was difficult to clear, and the added weight of the rain or heavy, wet snow led to roof collapses. March began exceptionally cold, with many locations seeing maximum temperatures of around zero or colder on March 3rd. Then by mid-month, temperatures moderated and became an ideal melt scenario with maximum temperatures above freezing in the daytime and below freezing at night. A cool-down by the end of the month solidified the statewide below normal average of around five degrees below normal. The coldest temperature found for the month was -29 degrees F at both Celena and Kabetogama in northeast Minnesota on March 2nd with the warmest temperature was 67 degrees F at Windom and Winnebago on March 28. After the March 9 heavy snow and rain event, the weather became more tame. The lamb-like second half of March contributed to the eroding of the snow pack, with very little precipitation falling for the second half of the month. The only significant snowpack remaining is across the northland. The U.S. Drought Monitor map released on April 4 shows no drought designation in the state. Minnesota has been free of any drought designation since February 26. The U.S. Drought Monitor index is a blend of science and subjectivity where drought categories (Moderate, Severe, etc.) are based on several indicators. On April 4, Many rivers and streams across southern and central Minnesota are much above normal to high with some smaller streams in the average range in southeast Minnesota. In the far north some rivers continue to be affected by ice. The Minnesota River has peaked at the various locations and is trending lower. The Mississippi River from Fort Ripley to Minnesota City has also peaked and is slowly receding. The Red River is on the rise with a peak in Fargo expected by the National Weather Service on April 7. 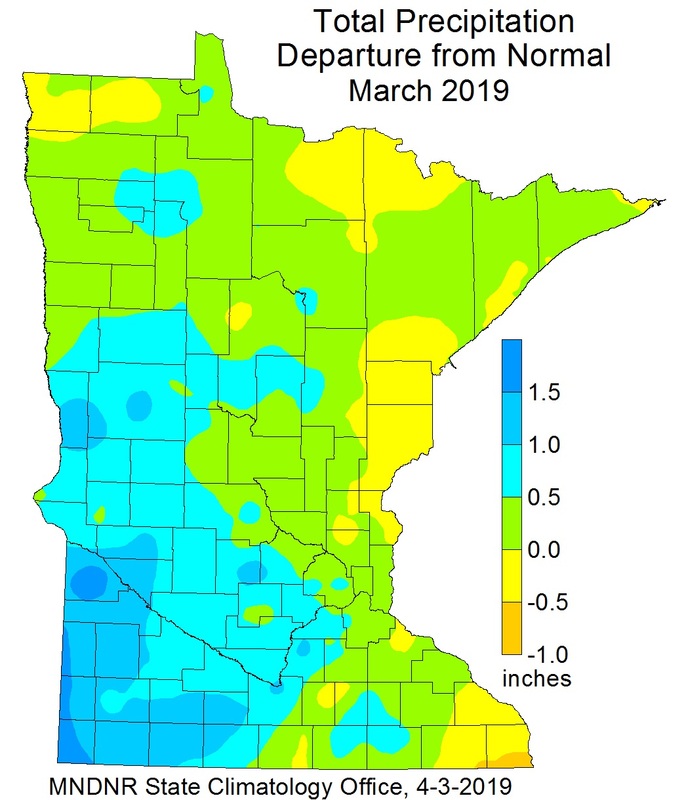 In their first report of the 2019 growing season, the Agricultural Statistics Service reported that topsoil moisture across Minnesota was 0 percent Very Short, 1 percent Short, 49 percent Adequate, and 50 percent Surplus. The potential for wildfires is currently rated by DNR Forestry as Low across the entire state. Historically, 80 percent of all wildfires in Minnesota occur during April and May. As of April 4, most of the frost is out of the ground for locations south of the Twin Cities with still a lens of frost between 14 and 26 inches at the U of M St. Paul Campus. At Watson in Chippewa County, the top 17 inches was thawed with a frozen depth to 42 inches. The ground is still mostly frozen in central and northern Minnesota at Long Prairie in Todd County the ground was frozen to 17 inches with no thaw at the surface yet. As of April 4, smaller and some medium-sized lakes across southern Minnesota are starting to lose their ice. This is fairly close to the median dates and about a month earlier than in 2018. The April precipitation outlook leans towards above normal precipitation across all but the far northwestern Minnesota. The best chance of above normal precipitation is in south central and southeast Minnesota. April precipitation normal range from one and one-half inch in northwest Minnesota to around three inches in southeast counties. The historical probability of measurable precipitation for any given day in April ranges from 20 percent in the far northwest to 35 percent in the southeast. The April temperature outlook favors above normal temperatures over the entire state, especially in the north. Normal April high temperatures are in the mid to upper 40s early in the month, rising to the low 60s by month's end. Early-April normal low temperatures are near 20 in the north, near 30 in the south. By month's end, low temperatures average in the mid-30s in the north, near 40 in the south. The 90-day precipitation outlook for April through June indicates a tilt to above-normal precipitation conditions for the southern half of Minnesota. There are equal chances for above, normal and below precipiation in the northern half of the state. The April through June temperature projection favors below normal conditions. So far lake ice out in southern Minnesota is progressing near to a week behind the historical median. Median dates of ice out for lakes in far southern Minnesota is the last week of March or the first week of April. The median date of ice out for the larger lakes in central Minnesota is mid-April. For the far northern lakes the median date of ice free is the last week of April or the first week of May. Subscribe to email announcements of the monthly posting of this product.